In addition to "raster" charts (issued from scan, such as Maptech), ScanNav supports S57 vector charts, including Official ENCs (*) from IHO, coded in S63 format. In vector charts, each object is known as such, and ScanNav can query each of them to show their details. You can therefore show the sectors of a light to immediately visualize their angle and range. 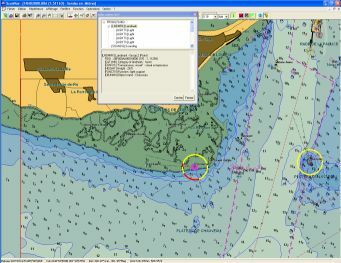 Official ENCs (Electronic Navigation Charts) are the charts issued directly from the Hydrographic Offices of the countries member of the IHO (International Hydrographic Office, (SHOM for France)). They are the only vector charts authorized in replacement of paper charts on Commercial and Military ships, according to the SOLAS convention. ScanNav is a distributor of Primar which is the organism responsible for centralizing ENCs of the different countries. Once you issue your order, a Cells permit file will be sent to you by mail. This file associated with a small utility will let you download the ordered cells and install them on your computer. This same utility will let you download upgrades regularly from the web site. It is also possible to order ENCs on a CD-rom providing an additional fee to take in account packaging and transportation costs. Prices of ENCs include a subscription(1) of weekly updates from 3 months(2) to 12 months. (3) Prices differ according countries. Please consult us for a full quote. Note the desired cell numbers on the IHO or Primar catalog (see links above) and send them to us for a quote. Or interactively choose cells on the Primar catalog, and then save you basket file and send it to us as an attached file for a quote. In all cases you will have to send us the results by mail by clicking here, we will return you a quote in the best delays.